After years of wide-ranging differences, relations between Iran and Qatar deepened almost overnight after a Saudi-led coalition broke ties with Doha and imposed a blockade on the small sheikhdom. On June 5, 2017, five nations – Saudi Arabia, the United Arab Emirates (UAE), Bahrain and Egypt and Maldives – accused the al Thani royal family of financing terrorism and promoting instability across the Middle East. The bloc made thirteen demands of Doha; the first was to break military and political ties with Tehran. Many Gulf monarchies have accused theocratic Iran of interfering in their internal affairs. They claimed Iran, predominantly Shiite, financed opposition groups in Sunni countries. The crisis highlighted the complex relationship between Tehran and Doha historically. They have cooperated over economic development, particularly on a natural gas field that they share. (Iran calls it South Pars; Qatar calls if the North Dome field.) It has an estimated 1,800 trillion cubic feet of natural gas—comparable to a quarter of global proven reserves. They have also signed several trade and security compacts. Regionally, they have both supported Islamist groups, including Hamas, the Palestinian party that has ruled the Gaza Strip since 2007. Qatar has brokered deals with Hezbollah, the Iranian-backed party and militia in Lebanon. The Islamic Republic, in turn, supported Qatar in its dispute with Bahrain over Fasht al Dibal Island. They have differed sharply, however, over relations with the United States. Doha has deep ties with Washington, a country Iran calls “the Great Satan.” Since 2001, Qatar has been home to the largest U.S. military installation in the Middle East. Al Udeid Air Base has hosted 11,000 American military personnel. Qatar and Iran also split on military strategy in the Middle East. Along with other Gulf countries, Qatar funded Saddam Hussein’s Iraq during his war with Iran between 1980 and 1988. The emirate has generally cooperated with its Arab neighbors in diplomatic disputes with Iran, beginning with creation of the Gulf Cooperation Council in 1981. Most recently, Doha recalled its ambassador to Tehran in 2016, after Iranian protesters sacked the Saudi Embassy. Since 2011, Iran and Qatar have been divided over Syria. Iran provided critical military and economic support to the Assad regime, while Qatar funded rebel forces. Like other Gulf countries, Qatar has also been alarmed by Iran’s military arsenal. Qatar has expanded its missile defense systems because of Iran’s growing capacity. It negotiated a $1 billion deal with Raytheon for the Early Warning Radar missile detection system. It has also purchased the U.S. MIM 104 Patriot surface-to-air missile system. And in 2012, it applied for the purchase of THAAD anti-ballistic missiles. Economically, bilateral trade between Qatar and Iran has been insignificant. In 2015, Qatar imported Iranian goods worth $104 million; it exported only $4.2 million in goods. In contrast, Qatar imported Saudi goods worth $164 billion over the same period. The trade balance began to change significantly after the Saudi-led blockade was imposed. Iran pledged to dramatically expand shipments of foodstuffs to Qatar. *Military figures reference the International Institute for Strategic Studies’ “The Military Balance 2017” published by Routledge. The following is a chronology of major events in the Iran-Qatar relationship, two major energy suppliers. 1979: Popular revolution swept the Shah from power in Iran. Like Saudi Arabia, Qatar rejected a resolution, proposed by Syria and Libya, supporting the new Islamic Republic at a meeting of the Organization of Arab Petroleum Exporting Countries. 1980: War erupted between Iran and Iraq. The Gulf countries perceived victory for either country as a losing scenario for them, since the two republics had both ousted monarchies. Sep. 30, 1980: Jordan’s King Hussein rallied support for Iraq from Arab nations, including Qatar. Oct. 11, 1980: Qatar’s foreign minister, speaking in Baghdad, reaffirmed Qatari solidarity with Iraq. February 1981: Iran accused Qatar and other Gulf states of secretly financing Iraq’s military campaign. December 1981: The Gulf-Cooperation Council (GCC) refocused on security arrangements after an alleged coup attempt in Bahrain by Iranian-supported opposition. Dec. 21, 1981: The Washington Post reported that Qatar was among five Gulf States to lend at least $16 billion to Iraq since the start of the Iran-Iraq War. Feb. 7, 1982: Qatar and five other Gulf States warned Iran against further subversive acts in the Gulf after the failed coup in Bahrain. The group stressed that they did not seek further deterioration in relations with Iran. Jun. 1, 1982: Qatar and other Gulf states joined in declaring neutrality in the Iran-Iraq War, although the Gulf monarchies did not completely cut all aid to Iraq. Mar. 12, 1984: After two days of talks in Riyadh, Qatar and the GCC renewed support for Iraq in the war. 1986: Iran supported Qatar’s claim—against Bahrain—to the contested Fasht al Dibal Island. Oct. 26, 1987: Qatar condemned Iranian missile strikes on Kuwaiti territory and shipping, but did not call for punitive sanctions. Dec. 30, 1987: Qatar urged the United Nations to adopt sanctions against Iran after Tehran’s refusal to abide by a ceasefire. Aug. 20, 1988: Iran and Iraq concluded a ceasefire in the war. Nov. 13, 1990: Qatar and Iran agreed to a joint investment of $3 billion to begin development of the South Pars gas field by 1994. Qatar had already begun development, but Iranian investment had been curtailed during the war. Nov. 26, 1990: Iran reversed a ban on purchasing oil directly from Qatar. The ban had been imposed in response to the GCC countries’ support for Iraq in the war. 1992: A border dispute between Saudi Arabia and Qatar pushed Doha to seek closer relations with Iran. Apr. 3, 1994: The Washington Post reported warming relations between Qatar and Iran, reinforced by a major trade deal. “We have good relations with Iran, because Iran has not done anything against Qatar,” said Qatari Foreign Minister Hamad bin Jassim bin Jabir. Jun. 27, 1995: Crown Prince Hamad Bin Khalifa al Thani led a bloodless coup against his father. Jun. 5, 1996: Bahrain arrested 44 suspects in an alleged coup plot supported by Iran. Qatar joined other GCC states in condemning the plot. Jun. 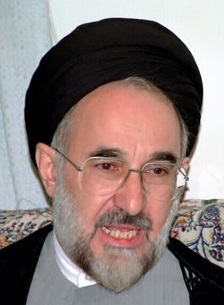 11, 1997: During a visit to the United States, Qatari Emir Hamad bin Khalifa criticized U.S. policy towards Iran, urging U.S. leadership to accept rapprochement with Iran and its new president, Mohammad Khatami. May 1999: Iranian President Khatami (below) visited Qatar during a tour to repair relations with the Arab world. 2006: Qatar and Iran pledged $50 million each to support Hamas after its victory in Palestinian parliamentary elections. Jul. 31, 2006: Qatar voted against a U.N. Security Council resolution demanding that Iran suspend nuclear enrichment, citing the need to give Iran more time to respond. Qatar was the only state on the Security Council that voted against the resolution. Dec. 31, 2006: Qatar joined a unanimous vote to impose sanctions on Iran for its nuclear program. Its envoy said Iran had the right to develop nuclear technology for peaceful purposes; Qatar supported sanctions to prevent nuclear proliferation in the Middle East. May 21, 2008: Qatar brokered a deal between Lebanon’s Saudi-backed governing coalition and the Iranian-backed opposition led by Hezbollah, ending an 18-month political crisis in Lebanon. Feb. 24, 2010: Iran and Qatar signed a defense pact to combat terrorism boost and maritime security. 2011: The Syrian conflict broke out. Qatar gradually moved from a cautious bystander of protests to openly funding rebel groups. Doha provided small arms and financing for opposition groups but declined to arm opposition groups with heavy weaponry. Sep. 5, 2011: Qatar’s emir visited Iran to urge Tehran to pressure President Assad to stop attacks on protesters. Sep. 25, 2012: Qatar’s emir called for the creation of an Arab coalition to negotiate a political transition. October 2012: Qatar’s Hamad bin Khalifa al Thani became the first foreign head of state to visit the Gaza Strip since Hamas took power in 2006. Many analysts interpreted the move to be an effort to undermine Iranian influence. Nov. 5, 2012: The U.S. Department of Defense notified Congress of the possible sale of new missile defense systems to Qatar. The country requested THAAD Fire Units amid increasing concerns over Iran’s regional ambitions. Mar. 26, 2013: Qatar hosted the Arab League Summit in Doha and supported a successful bid to give Syria’s seat to the opposition Syrian National Coalition. Jun. 25, 2013: Qatar’s emir, Sheikh Hamad bin Khalifa al Thani, stepped down in favor of his fourth son, 33-year-old Tamim bin Hamad al Thani (left). Jan. 22, 2014: At a peace conference on Syria, the Qatari Foreign Minister said that his country views Iran as crucial to resolving the crisis. Iran was not invited to the Swiss meeting. Jan. 6, 2016: Qatar recalled its ambassador to Tehran in solidarity with Saudi Arabia after protestors stormed the Saudi Embassy in Tehran. Qatar did not break relations with Iran, however, unlike Bahrain and Sudan. The protestors were enraged by Saudi Arabia’s execution of a prominent Shiite leader who supported anti-government demonstrations. April 2017: Qatar paid nearly $1 billion in a hostage deal to secure the release of 26 Qatari royal family members kidnapped, during a hunting trip in Iraq, by the Iranian-backed Kata’ib Hezbollah militia. Apr. 16, 2017: Iran announced completion of several development projects in the South Pars/North Dome gas field after Qatar lifted a moratorium on development of its side. May 24, 2017: Qatar News Agency was reportedly hacked when the news agency ran a story quoting the Qatari emir praising Iran and criticizing Donald Trump. Qatari officials denounced the story as false, but the story was a trigger for Saudi Arabia, the UAE and others to blockade Qatar. Jun. 5, 2017: A coalition of nations broke off relations with Qatar, citing its alleged cooperation with Iran and support for terrorism abroad. The crisis halted shipments of food and air travel between Qatar and neighboring countries. Jun. 11, 2017: Iran began sending Qatar massive shipments of food, pledging 100 tons of food daily until the crisis was resolved. Jun. 23, 2017: Kuwait relayed to Qatar a list of 13 demands, including downgrading relations with Iran. Jun. 25, 2017: In a telephone call between the country’s leaders, Iran and Qatar committed to deepen cooperation. Jul. 3, 2017: Iran signed a major gas deal with Total , the United Kingdom’s largest commercial gas supplier, and China National Petroleum Corporation over a section of its South Pars field on the border with Qatar. The move was interpreted as an indication of warmer relations between Doha and Tehran. Jul. 18, 2017: The Saudi-led coalition dropped the list of 13 demands to six principles. Jul. 25, 2017: Qatar’s Defense Minister thanked Iran for opening up its airspace to Qatar and supplying food to the sanctioned nation. Evan W. Burt is a research assistant at the Woodrow Wilson International Center for Scholars. Photo credits: Tamim bin Hamad al Thani 2015 by Presidencia de la República Mexicana [CC BY 2.0 (http://creativecommons.org/licenses/by/2.0)], via Wikimedia Commons; GCC flag by Rico Shen (Image:Int-GCC-flag.gif and Image:GCC Logo.svg) [Public domain], via Wikimedia Commons; Key Petroleum Sector Facilities (2004) via CIA PCL Map Collection hosted by The University of Texas at Austin, University of Texas Libraries; Mohammad Khatami via Khamenei.ir.